Reason: The last example clearly shows something that is not sente, opposite to what the author believes. Since Bill neither agrees, this page's fate is sealed. Lets assume that the move a on a board B causes the temperature t of B to become x. We can write this as t(B:a) = x. 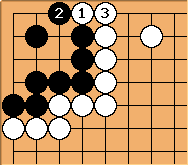 The move a is called sente if and only if there does not exist a move b where t(B:ab) > x. Bill: What has yet to be demonstrated is how this definition fits the usage of the go term, sente. A formal definition does not have to fit informal usage precisely, of course. :) But it should approximate it. Besides, a technical sense of sente already exists, complete with a formal definition. I know, because the term, ambiguous position, arose out of attempts to formalize the notions of sente and gote. Anon: I am not trying to fit the usage of sente, only move sente, (see page title.) If a technical definition already exists, please provide a link. tapir: This definition says "Only the move(s) with the biggest follow up is sente." Common usage is more like "Moves that increase temperature are sente." even if you have to play them in the right order to get them answered. Bill: Well, I am not exactly sure what you mean by move sente. What appears to be missing from your definition is that the sente sequence of play must be even (the opponent replies at each step), culminating in a drop in temperature after the last play. raises the temperature, threatening to jump to the 2-1 point. reduces the temperature, but it is still greater than the original temperature. completes the sequence of play in a temperature that is lower than the original. The whole sequence is gote, not sente, even though it appears to fit your definition of sente. Anon: is probably not sente (depends on the rest of the board). is only sente according to the definition above if it is the last move of the game (a peculiarity of the definition is that the last move of the game is usually considered sente (depends on the scoring system being used)). Anon: I don't think its useful to discuss small sections of the board with this definition. For example, white 1 in the following diagram would normally be considered a 6 point gote move. But in the following diagram, white's move is sente (assuming there are no bigger moves elsewhere) according to the definition above, and I think that is inline with general usage in this situation. Bill: Well, as I said, I am not exactly sure what your intended meaning of sente move is. I would have thought that the last diagram would not be sente, as does not raise the temperature. However, if you consider the two positions as a unit, then you can say that raises the temperature, and it would fit your definition. However, I do not think that general usage is to call it sente. Rather, people call it miai. Hyperpape: I too would be surprised to here this move described as sente. Bill: Slightly later. I just noticed that your definition does not say that the sente move raises the temperature. That certainly does not come close to ordinary usage!